The tribes compete in a classic Survivor blindfold challenge with a caller directing their tribe to retrieve puzzle pieces and help a castaway solve the puzzle blindfolded. 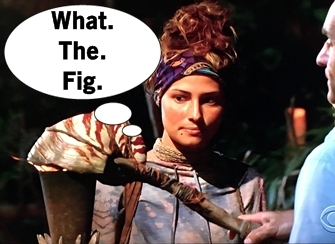 Figgy gets a big lead for her tribe as caller but the other tribes are just so much better at puzzle than Figs, so her tribe loses the reward of milk, cookies, cupcakes, and pie. It was probably hot milk anyways. Meanwhile, Hannah has a panic attack on the sidelines for the challenge from all the suppressed stress of this game. Hopefully a cookie will help. A cookie is definitely just another prize of the day for Jay, who finds the Ikabula Hidden Immunity Idol with Will. Too bad Michaela stumbles upon this big moment and knows about it too - whoops! It's really not going so well for Figgy. 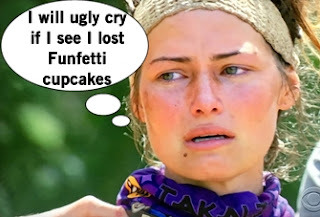 She blew the challenge for Takali and made Michelle a target on the Vanua tribe by outing how tight they are. But at least she has Taylor? Because neither can keep a secret in any way, the self-dubbed Figtails decide to reveal their showmance to Ken and Jessica and SURPRISE, they're not surprised. When it comes to the Immunity Challenge, Michaela actually gives advice to a the Vanua tribe to beat Figgy at the balance puzzle (I guess this is the good deed after berating her tribemate Hannah the whole time during the puzzle). Figgy's terrible, horrible, no good, very bad day continues with yet another challenge loss due to her blowing a lead. Heading to their first Tribal Council as a shuffled tribe, Adam has to choose a side between Figtails and Gen X. Figtails wants to target Ken who they consider an impending merge threat, while Jessica and Ken want to target Figgy since she's the brains of the showmance. Adam is worried about putting his trust in a future group of allies he's never even spoke to. What's a Millennial to do? Tribal Council time! Taylor is very confident that the three Millennials will stick together to pick off Gen X. The showmance is called out and everyone laughs about how obvious it has been. Jeff Probst offers his ordained minister services to hopefully get ratings gold, but alas Figtails aren't that serious. Figgy tries to explain away their showmance as two people that will always vote together which isn't any better when this is a game of numbers. Taylor believes if Adam flips to the Gen X side all the Millennials will join forces come merge to boot him. Adam explains he knows his vote will upset someone leaving and someone returning, but he's thinking of the longterm. With a 3-2 vote the tribe has spoken and Figgy is voted out of the game. The fans rejoice at never having to see Taylor whisper flirt with Figgy again. Sidebar: this week in Survivor, I had the amazing opportunity to attend Rob Has a Podcast's Survivor Know-It-Alls LIVE. It was so much fun to watch the episode with castaways old and new, as well as finally meet in person some of my longtime Twitter friends. Thanks for a fun night everyone, especially Rob Cesternino for hosting one of my favorite weekly Survivor podcasts.